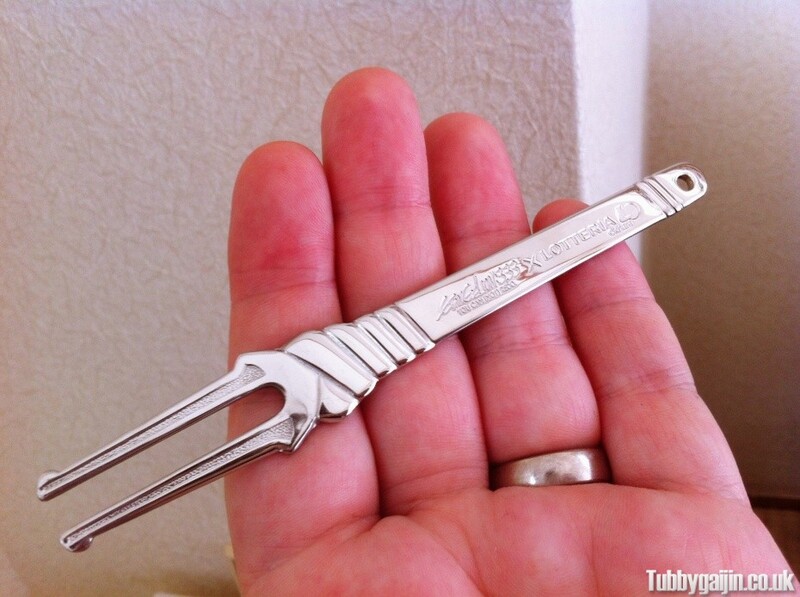 This promotion is running to celebrate the release of Evangelion 3.33 on Blu Ray and DVD, the price is a slightly steep ¥1280 but you get a free gift in the form of a Spear of Longinus fork! With no self respect left to lose I headed down to my local Lotteria. I guess this burger isn’t too popular yet, as the poor staff member had to call her supervisor over to find it on the till, eventually they did and I went to find a seat. The Lotteria in Shinsaibashi is ridiculously space efficient, with tiny little single tables for each person to slide into. I found myself a spot away from the crowd to eat my shameful burger in privacy. About five minutes later, my burger arrived. 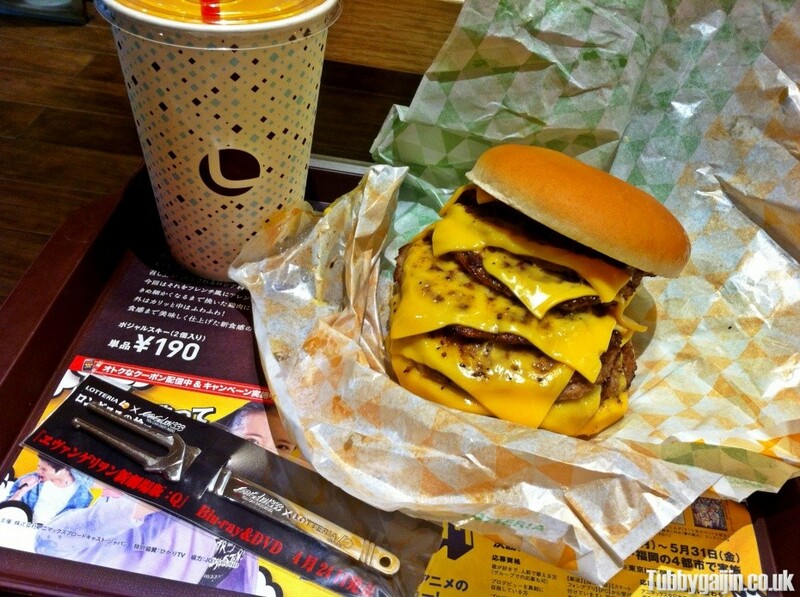 It was double wrapped to hold it together, but surprisingly small – not much larger than a big mac. 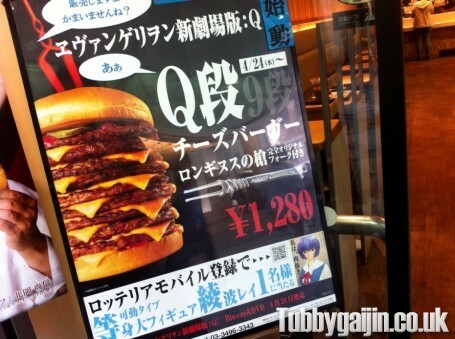 In reality, the Q burger isn’t the proud tower from the posters, it’s actually a little sad looking. The stack of burgers and cheese were completely unable to hold their own weight and flopped down into a semi-diagonal slump. How did it taste? Not so bad… it was very greasy and difficult to eat as it was so tall. The burgers were very thin and didn’t seem to taste anywhere near 100% meat to me, but I could be mistaken. Aside from the burgers and cheese, there was a little ketchup and some pickles – a very simple burger. I felt rightfully ashamed of myself once I’d polished this off – but not all that full. 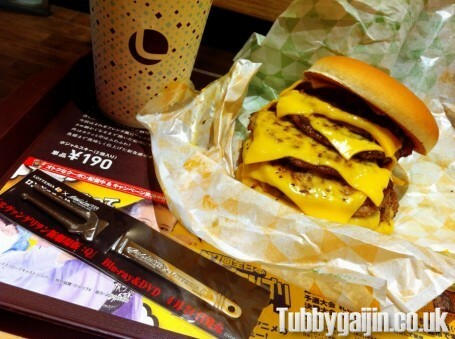 I love a good burger but a good burger this was not – but hey, I got my fork. To offset the effects of what I’d just eaten, I decided it was best to walk home. 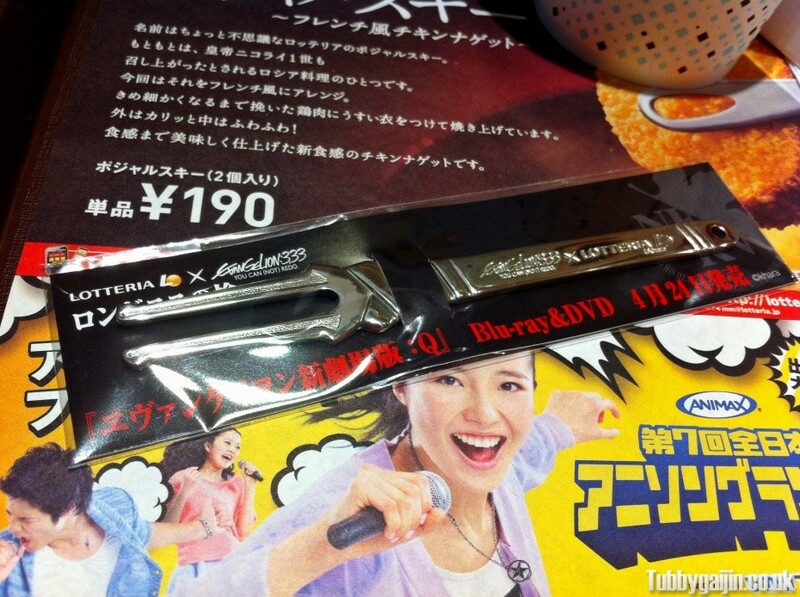 Luckily, the fork itself is pretty cool with lots of nice detail including Evangelion and Lotteria logo engravings. I can’t see myself using it for eating though, it’s too nice! The Q burger didn’t do much to change my opinion of Lotteria, if you want a chain burger restaurant you’re much better off heading to Freshness Burger.